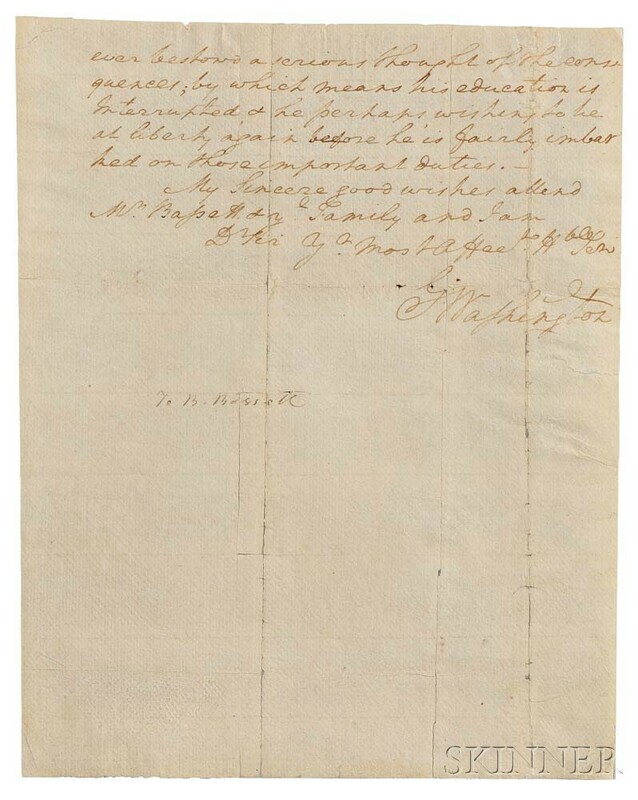 Washington, George (1732-1799) Autograph Letter Signed, Mount Vernon, 20 April 1773. Washington, George (1732-1799) Autograph Letter Signed, Mount Vernon, 20 April 1773. Washington, George (1732-1799) Autograph Letter Signed, Mount Vernon, 20 April 1773. 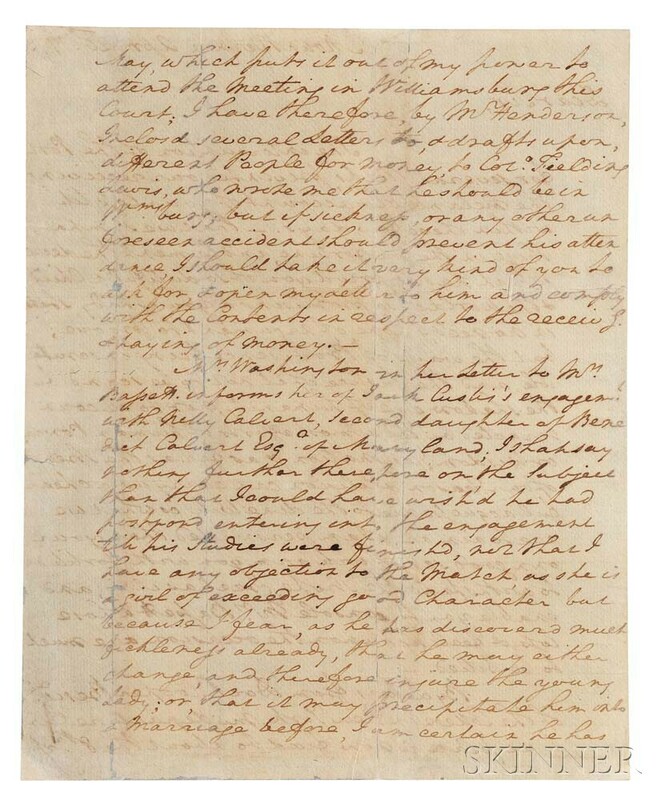 The full text in Washington's hand, to Colonel Burwell Bassett Sr. (1734-1793) on two sheets of laid paper, inscribed over two and a half pages; formerly in the collection of Dr. Gilbert C. Norton of Endicott, New York; sheets expertly mended and strengthened along the folds, 9 x 7 in. "Dear Sir, The interruption of the Post for several Weeks, prevented our receiving the melancholy account of your loss till within these few days. That we sympathize in the misfortune, and lament the decree which has deprivd you of so dutiful a Child, & the World of so promising a young Lady, stands in no need, I hope, of argument to proove; but the ways of Providence being inscrutable, and the justice of it not to be scand by the shallow eye of humanity, nor to be counteracted by the utmost efforts of human Power, or Wisdom; resignation, &, as far as the strength of our reason & religion can carry us, a chearful acquessence to the d[iv]ine will is what we are to aim at: & I am perswaded that your own good sense will arm you with fortitude to withstand the stroke, great as it is and enable you to console Mrs Bassett whose loss, & feelings upon the occasion, are much to be pitied. By Letters from Doctr Cooper, Presidt of the College in New York, my departure for that place is now fixd to about the 8th of May, which puts it out of my power to attend the Meeting in Williamsburg this Court; I have therefore, by Mr Henderson, Inclosd several Letters to, & drafts upon, different People for money, to Colo. Fielding Lewis, who wrote me that he should be in Wmsburg; but if sickness, or any other unforeseen accident should prevent his attendance, I should take it very kind of you to ask for, & open my Letter to him and comply with the Contents in respect to the receivg & paying of money. Mrs Washington in her Letter to Mrs Bassett informs her of Jack Custis's engagemt with Nelly Calvert, Second daughter of Benedict Calvert Esqr. of Maryland; I shall say nothing further therefore on the Subject than that I could have wish'd he had postpond entering into the engagement till his Studies were finishd, not that I have any objection to the Match, as she is a girl of exceeding good Character but because I fear, as he has discoverd much fickleness already, that he may either change, and therefore injure the young Lady; or, that it may precipitate him into a Marriage before, I am certain, he has ever bestowd a serious thought of the consequences; by which means his education is Interrupted, & he perhaps, wishing to be at liberty again before he is fairly imbarked on those important duties. The Virginia Gazette for 25 March 1773 contains the following notice: 'On Sunday last died, in the 14th year of her age, Miss Betsey Bassett, eldest daughter of Col. Burwell Bassett, a very amicable and promising young Lady.' Burwell Bassett was a lifelong friend of Washington's. He was married to Martha Washington's sister Anna Maria Dandridge (1739-1777), with whom he had eight children. Washington departed Mount Vernon for New York on 10 May 1773 to enroll John Parke Custis in King's College.